What is the easiest audio format converter? "I need a good audio converter program that can convert audio files into midi format? ""I need a mp3 audio converter that can convert audio files into mp3 format?" The questions above are usually asked by users, and what we need is an excellent audio converter. 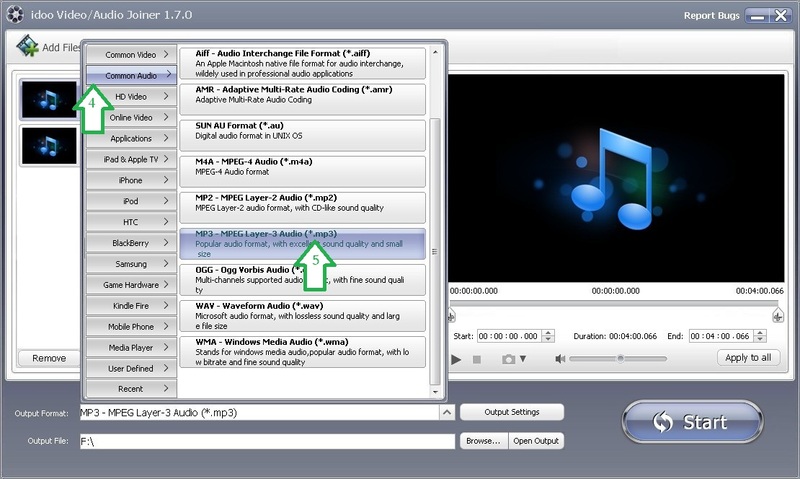 There are so many free audio converters, however we may ask for more than that, such as a video to audio converter. Most professional audio converters are complicated to operate, while for general users, it would be ideal if it is easy to use. idoo Video Editor is the easiest audio format converter, more than that, it integrates powerful function of audio and video editing. How to convert audio into mp3 ? First of all, you can get this audio converter free download here. You may have a try after installing it. The “Common Video” is listed and you may easily find the mp3 format. Meanwhile, the audio quality, sample rate or audio channel can be adjusted before outputting. The following part will illustrate how to convert audio into mp3 format by this audio converter. 1. 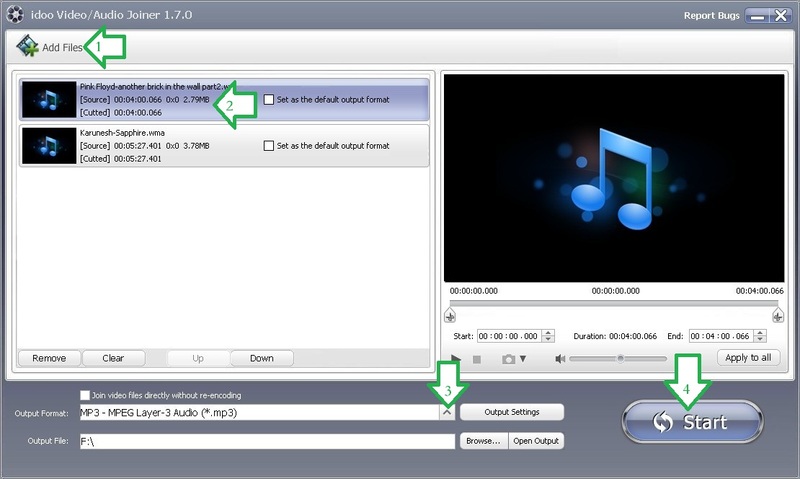 Open the “Joiner” function, click “Add File” (Arrow1) to add two or more audio files to edit. 2. Select the audio file which you want to convert into mp3, see Arrow2. 3. Click the drag-down list (Arrow3). 3. Click “Common Audio” (Arrow4) in the drag-down list. 4. Select the mp3 format from the right list (Arrow5), then click “Start” to begin converting. After that you may do further editing jobs to the audio. For more information, please refer to relative articles in our sites. How to convert common video formats? Article Resources Related To 4K Video Editing And Converting Issues(2019) Seven Secrets About Convert 4K Video To Other Formats The Easier Way To Convert 4K Video To 1080P With High Quality How to Add Watermark to MKV Files? The Best MACBook Air Video Editing Software | MACBook Air Video Editor Download The Best Video Editor for GoPro How to Add Text to MP4? How to Add Effects to TS Files? What idoo Video Editor can do for YouTube? 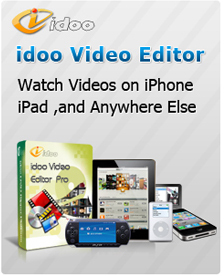 What can idoo Video Editor do in Windows 8/7/XP? idoo Video Editor: What Does It Mean to Your Samsung Phone How to edit your videos use idoo editing software? Idoo Editor's Tech specs and reference How to cut and trim videos? What Can I Do for you, iPhone 5 and iPhone 5S? How to preview the videos when add the watermarks, and how to convert them into the format we want? How to add watermark to video and add more special effects? How to create a watermark and more special effects to video? How to watermark an image by time settings? How to add batch watermarks to video? How to watermark video? How to add watermark to video? How to cut wmv video? How to cut MP4 video? How to cut mov files? How to cut video clips? How to cut split video for YouTube? How to cut and effect video? How to easily cut AVI video? How to cut 3GP?